According to archaeologists these ancient rock carvings represent 10,000-year-old depictions of ancient aliens and UFOs. 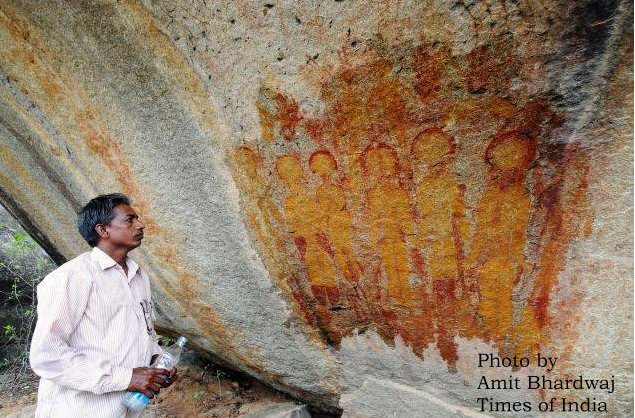 Scientists are now trying to unravel the mystery behind the curious paintings and seek help from NASA, ISRO (Indian Space Research Center) and other archaeologists in order to learn more about the origin of these carvings. The rock paintings were discovered in caves located about 130 kilometers from Raipur, the capital city of the state of Chhattisgarh, India. 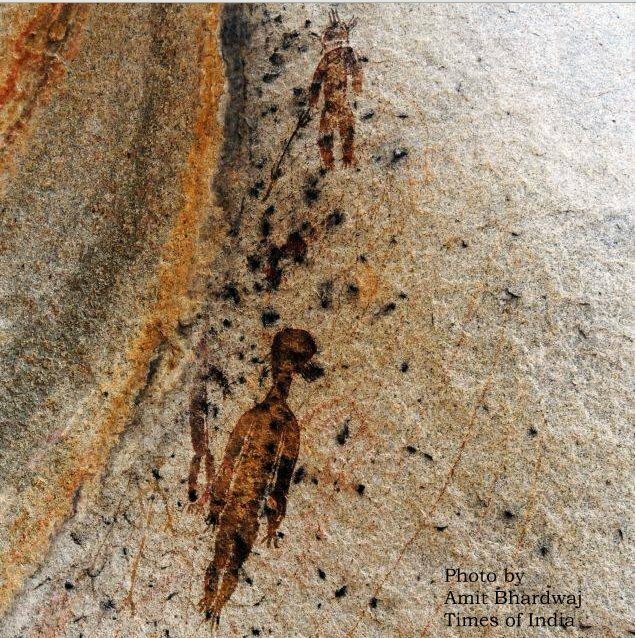 According to Times Of India, archaeologist JR Bhagat says these paintings depict aliens in spacesuits. There are several beliefs among locals in these villages. While few worship the paintings, others narrate stories they have heard from ancestors about “rohela people” – the small sized ones – who used to land from sky in a round shaped flying object and take away one or two persons of village who never returned. “The paintings are done in natural colors that have hardly faded despite the years. The strangely carved figures are seen holding weapon-like objects and do not have clear features. Specially, the nose and mouth are missing. In few pictures, they are even shown wearing space suits. What’s interesting to note is that these “beings” look very similar to the alleged alien mummied found recently in peru. We can’t refute possibility of imagination by prehistoric men but humans usually fancy such things,” the archaeologist said. He added that it is a co-incidence that such ancient images appear to have sharp resemblance to UFOs shown in alien movies. “The fan-like antenna and three legs of vehicle’s stand clearly show a similarity to UFO type craft,” he said. As described in MessageToEagle’s article Flying Machines Soaring Through Ancient Sky Of India, several ancient texts like Yajurveda, Mahabharata, Samarangana Sutradhara, Rigweda, Ramayana and even older ones relate the presence of advanced extraterrestrial beings in prehistory. India was the country of flying machines known as Vimanas that were frequently visible in the ancient skies. It therefore seems logical to assume that ancient people who witnessed these alien visitors made depictions of them. However, what might seem confusing at this point is why Indian archaeologists believe help from NASA and ISRO can cast more light on these 10,000-year-old cave paintings.